Add an Eventbrite event signup form to your videos! Event signups are a fantastic way to gather leads, and video is a great way to promote your events. Wouldn’t it be nice if there was a way to combine the two? Great news! There is - with the Wistia-Eventbrite integration. Eventbrite is a powerful and popular tool for creating events, managing ticketing, processing payments, and more. If you’re throwing an event, you probably already know and love it. With this integration, you can place an Eventbrite signup form in your videos, so that your video about your upcoming event can double as a tool to drive attendance and ticket sales. And the best part? It’s super easy. You’ll need two things: an event that you’ve created in Eventbrite, and a video that you’ve uploaded to Wistia. Got ’em? Great! 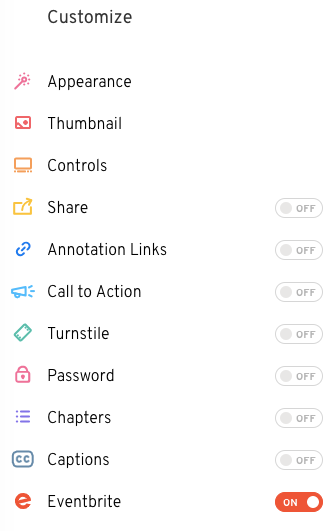 Head to your video’s page in your Wistia account and choose Customize from the Video Actions menu. Click Eventbrite on the sidebar. Here, you’ll be able to choose your event and set the time at which it appears in your video. To select the event, just paste in the Event ID from Eventbrite! If you’re not sure where to find that, this help page from Eventbrite explains. Then, set the time at which you would like the signup form to appear. You can do that either by typing in the time in the field on the left, or by dragging the waypoint along the playbar of the video to the desired point. You’ll see a preview of the form over your video so that you’ll know exactly what your viewers will be shown.